Orator, writer, historian, artist, statesman. By all accounts, Winston Churchill was a truly extraordinary man. His remarkable life has been the subject of enormous interest, spawning countless biographies and books on everything from leadership to painting (a favorite hobby of Churchill’s). 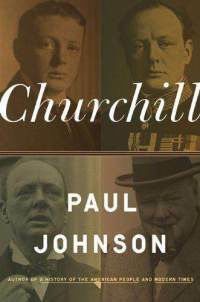 In his short yet exceptional Churchill (Penguin, 2009), master historian Paul Johnson does us all a great service, providing a concise, vivid, and highly memorable account of one of the most fascinating figures of the twentieth century. Below are the five lessons Johnson provides from the life of Churchill, excerpted straight from the book. He did not always meet his elevated targets, but by aiming high he always achieved something worthwhile (163). Mistakes he made, constantly, but there was never anything shoddy or idle about his work. He put tremendous energy into everything, and was able to do this because he conserved and husbanded his energy, too. There was an extraordinary paradox about his white, apparently flabby body and the amount of muscle power he put into life, always (164). 3. Never allow mistakes, disaster, accidents, illnesses, unpopularity, and criticism to get you down. He had courage, the most important of all virtues, and its companion, fortitude. These strengths are inborn but they can also be cultivated, and Churchill worked on them all his life (164). 4. Don’t waste time and emotional energy on the meanness of life: recrimination, shifting the blame onto others, malice, revenge seeking, dirty tricks, spreading rumors, harboring grudges, waging vendettas. Having fought hard, he washed his hands and went on to the next contest… There is nothing more draining and exhausting than hatred. And malice is bad for the judgment. Churchill loved to forgive and make up (165). 5. The absence of hatred leaves plenty of room for joy. He liked to share his joy, and give joy…Churchill was happy with people… He showed the people a love of jokes, and was to them a source of many (165). I love it dawg. Words from the wise. lesson #5 resonate with my life and belief. I try to be joyful as much as possible in my everyday life. But sometimes this is tough I just feel tired and exhausted, I guess point 3 will solve this problem.